The Great Cross sits on a wagon, and acts as a beacon of inspiration to the army, and a reminder that they are on God's mission. The cross is guarded by an elite unit of infantry, who would rather die than let it fall into enemy hands. 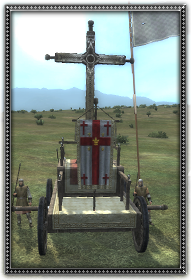 This unit can only be used by crusading armies. Golden cross to inspire the troops, and remind them that they are on God's mission.